Oregon’s Residential Beekeeping Law. What is this law about? The premise behind House Bill 2653 is that well-educated beekeepers, community members, and government officials are key to ensuring the stability of pollinator populations in urban areas. In recognition of the importance of education, HB 2653 requires the Oregon State University (OSU) Extension Service to produce written Best Practices Guidelines that detail the best practices for residential beekeeping. When applied, these practices are meant to maximize the benefits of beekeeping, reduce the risk of nuisance, and provide clear guidance on how to deal with nuisance issues if they arise. 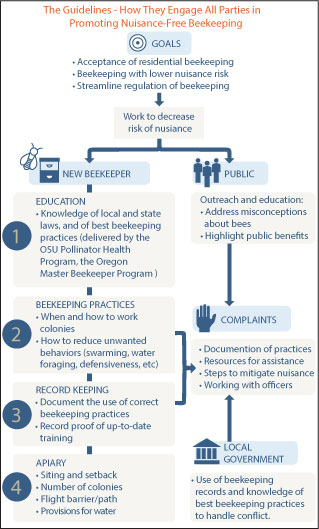 The OSU Extension Service is required under the HB 2653 to collaborate with the League of Oregon Cities and the Association of Oregon Counties in making this information available to governments, beekeepers, and the general public. Under HB 2653, all local city and county governments shall review their current beekeeping ordinances, and make any changes or additions to their ordinances by January 1, 2019. A local government’s first responsibility is to read and understand the Best Practices guidelines. They then must assess whether these guidelines, in conjunction with local nuisance ordinances (when needed), are sufficient to balance the needs of the public, property owners and beekeepers. In other words, local government is tasked with considering whether these guidelines and existing nuisance ordinances can eliminate the need for developing and servicing specific beekeeping regulations.